David Cranton for the respondent. UPON MOTION by the applicant for an order staying his removal to Pakistan which is scheduled to take place on February 1, 2009. AND UPON noting that the applicant is a citizen of Pakistan who moved to Canada in November 1998. 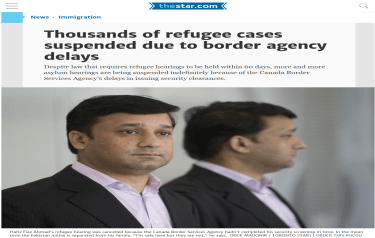 His refugee claim was denied and leave to judicial review the decision was denied. AND UPON noting that the applicant’s PRRA application was rejected. AND UPON noting that the applicant is a member of the Pakistan Peoples Party and that he was targeted for persecution by the political opponents of his party. AND UPON noting that the applicant was a polling agent. AND UPON noting the letters from Rao Sikander Iqbal, the candidate the applicant supported in the election and the letter from Abdul Majad Malik of the Pakistan Peoples Party Canada. AND UPON reading the filed material and hearing counsel for the parties. secondly, that he would suffer irreparable harm if no order was granted; and thirdly that the balance of convenience considering the total situation of both parties favours the order. AND UPON being satisfied that the applicant has raised a serious issue to be tried, namely, did the PRRA Officer properly assess the contents of the two letters submitted by the applicant? AND UPON being satisfied that the applicant would suffer irreparable harm if the order is not granted, in that, should the assessment of the contents of the letters by an officer determine that the applicant would suffer persecution, irreparable harm would result. AND UPON being satisfied that the balance of convenience favours the applicant. He can be removed if his application for judicial review is not successful. THIS COURT ORDERS that the removal of the applicant from Canada to Pakistan is stayed until leave in his application for leave and for judicial review is denied and if leave is granted then his removal is stayed until his application for judicial review is dealt with by the Court.